Just like his relationship with Golden Glory and their parent company Knockout Investments (KOI), Alistair Overeem’s (Pictured) legal battles with his former management is officially a thing of the past. After nearly a year of litigation, the UFC heavyweight and Golden Glory have finally come to terms on a settlement. “Everyone worked extremely hard to resolve these matters so that KOI, Golden Glory and [Golden Glory owner] Bas Boon can walk away and move forward with the Glory World Series Promotion in Europe, Japan and the USA, and Alistair Overeem can concentrate on his fighting career with his new manager Glenn Robinson at Authentic Sports Management and his new team, the Blackzilians,” Rick Lindblom, GG’s legal counsel, expressed in press release. Last November, Overeem sued GG for neglecting to pay him more than $150,000 in earnings, including a massive bonus for signing with the UFC. He claims his former representatives were keeping pertinent information from him during their negotiations with the UFC. GG then fired back by trying to have a Nevada District Court withhold his UFC 141 purse so they could recoup payment for past services rendered. They claimed Overeem did not pay them their commission following his Strikeforce win over Fabricio Werdum on June 18th. The management then negotiated Overeem’s deal with Zuffa, the parent company of UFC, in September 2011 which was parlayed into a blockbuster bout with Lesnar. Golden Glory believed they were owed a 30 percent commission on all of that dough. 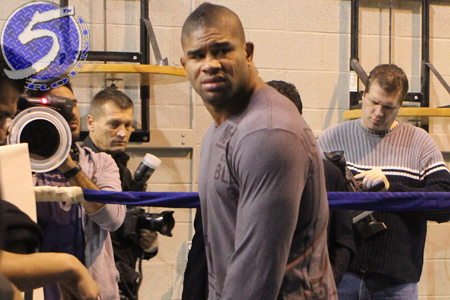 Overeem ultimately received his UFC 141 paycheck, which lead GG to attempt a run at his PPV bonus. Terms of their settlement were not disclosed. “The Demolition Man” is currently serving a nine-month testosterone suspension and is eligible to reapply for licensing as early as December 27th. He’s slated to make his return against Antonio “Bigfoot” Silva at UFC 156.